Alright, so the news has been out for a few days now, and everyone's had time to be informed on exactly what YouTube Red is. And now, I'm going to talk about it. Personally, I knew that YouTube was eventually going to come out with some kind of subscription service that would remove ads from the site. People have been begging, pleading for ages to have a subscription to remove ads from YouTube. So here we have it, YouTube Red. And that's all that is included for now. 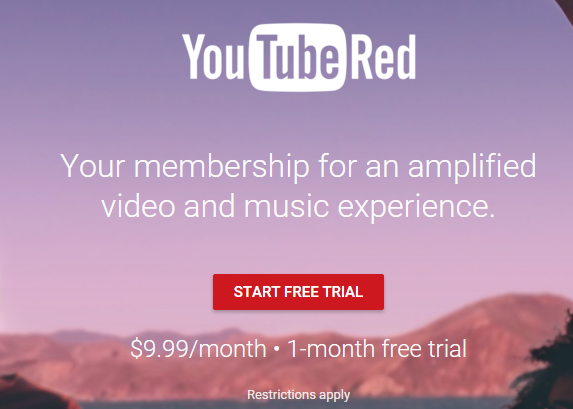 YouTube Red might expand to include even more perks, making the deal even more compelling. Folks who have Google Play Music/YouTube Music will get to take advantage of this service with no extra charge (or so I was informed; correct me if I'm wrong). That all in itself probably makes YouTube Red worth it. At the same time, maybe I have the less popular opinion. Just look at the ratings of that video. Now here's the other thing about YouTube Red that should cause folks who use ad-blocking software a cause for concern. Ad-blockers all over the place have said publicly that they'd pay for a YouTube subscription to remove the ads. I wouldn't be surprised to see Google follow through with this. I could easily see YouTube enacting harsher penalties for folks who are caught using ad-blocking software/techniques. Overall, I think YouTube Red is a good thing. At the same time, it's also a sign that YouTube is moving into the more professional realm of content, their their new original series'.